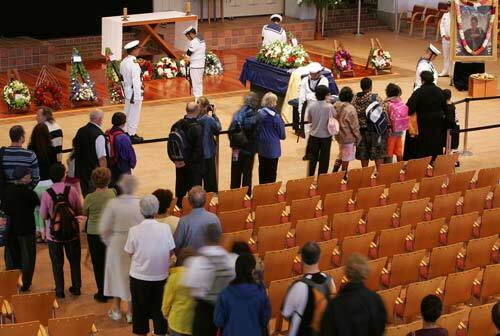 Members of the public queue to farewell Sir Edmund Hillary as he lies in state in the Auckland Cathedral of the Holy Trinity on 21 January 2008. His coffin is guarded by members of the defence force. The next day Sir Edmund was taken from the cathedral to St Mary's church for the funeral service. Thousands of people lined the route to St Mary's and gathered in the Auckland Domain and other city venues to view the service on large outdoor screens. At the service 500 people from all over the world gathered to farewell Sir Edmund. Speakers included Prime Minister Helen Clark, members of the Hillary family and Norbu Tenzing Norgay – the son of Tenzing Norgay who, with Sir Edmund, was the first to reach the summit of Mt Everest on 29 May 1953.